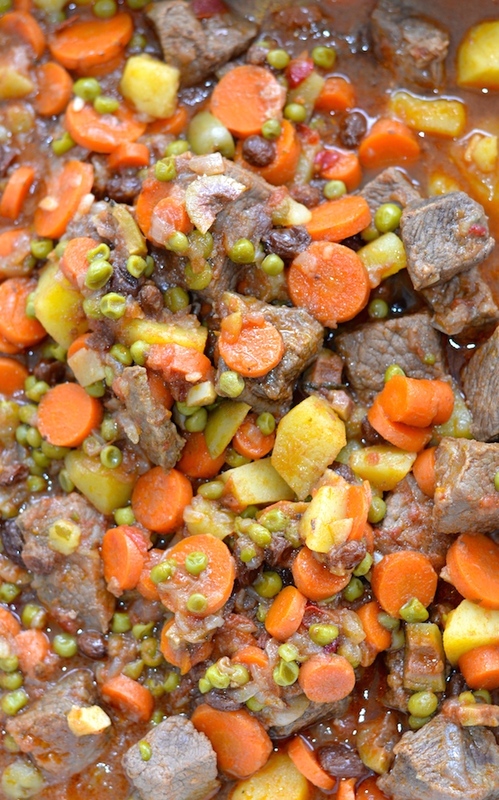 Comforting Organic Grass Fed Beef Stew, a wonderful, full of flavor, healthy homemade dish. I love the aromas coming out of the kitchen, all the different salty and sweet ingredients, and the outstanding comforting taste of this traditional meal. You are what you eat and that applies to cows too. This is the reason why I choose to buy grass fed beef. Grass-fed has less total fat than grain-fed beef. It contains up to 5 times as much Omega-3! It also has more vitamin E and minerals like potassium, iron, zinc, and phosphorus. A cow that eats grass is eating real food vs. a grain-fed cow who eats a highly processed grain diet full of chemicals and genetically modified corn. Think about it this way: Eat real food that eats real food! I served my Comforting Organic Grass Fed Beef Stew over Quinoa this time and it was so delicious! I am as always trying to stay away from cans and boxes and this recipe uses fresh ingredients except for 3 tablespoons of Tomato Paste and Pacific Organic Beef Broth . Pretty good I think! A little prep time is needed to cut all the fresh vegetables. 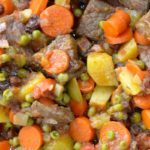 Then you need to get a little organized not to miss all the wonderful ingredients integrated in this Grass Fed Beef Stew. Olives, Currants , peas, carrots, potatoes, onions, tomatoes. Yum! My mouth is watering! 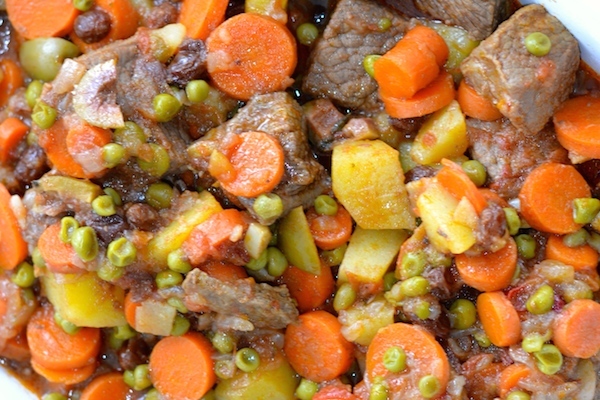 You can make this delicious recipe in a Slow Cooker , but I decided to make this Comforting Organic Grass Fed Beef Stew in a regular pot this time. I cooked it for about 1 hour in low heat, and the meat came out super tender and the stew full of wonderful homemade flavors. Great and comforting family meal. Serve it over brown rice or quinoa. You can also skip the potatoes in the stew and serve it over mashed potatoes. Heat just a little cooking oil in a big pot and sauté the onions with salt and pepper to taste. Then add the beef and cook for a couple of minutes in medium heat. Start adding the rest of the ingredients and mix everything well. Add the broth mixed in with the flour at the end. Check to see If you want more sauce, you can add a little more broth or water. Cook in low-medium heat for about 1 hour. Make sure you check every 20-30 minutes and mix a little more to integrate all the flavors. You can again check and add a little more broth if needed. It depends on your taste. Ready! Serve over brown rice, quinoa or mashed potatoes. I hope you enjoy my recipes and let me know if I can help with any questions. Feel free to leave a comment or a review. Would love to know that other families are also enjoying this recipe. Sounds like a good recipe but I’m struggling with the raisins. I’ve never had a stew dish with something sweet in it so I’m intrigued. I’ll have to see if I can get the wife on board. :). I’ll try not this weekend. Wish me luck!